Journal Reference: Chen J, Y Liu, M Zhang, and Y Peng. 2018. "Height Dependency of Aerosol-Cloud Interaction Regimes." Journal of Geophysical Research: Atmospheres, 123(1), doi:10.1002/2017JD027431. 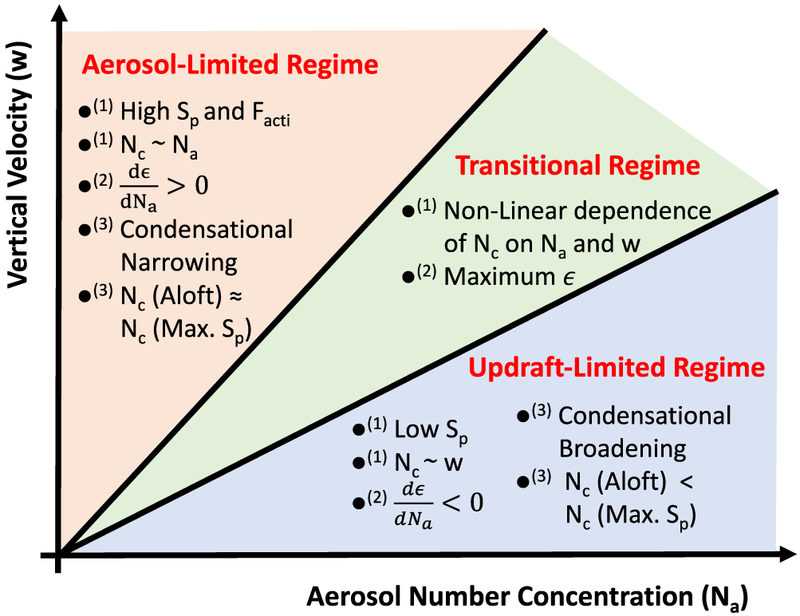 Schematic illustration of the main characteristics of aerosol-cloud interaction regimes. Note that the transitional regime defined by the ϵ behavior at the level of maximum supersaturation is a single line, i.e., for a fixed set of aerosol properties other than Na. The region of transitional regime in this figure is used to schematically illustrate the range of aerosol properties. 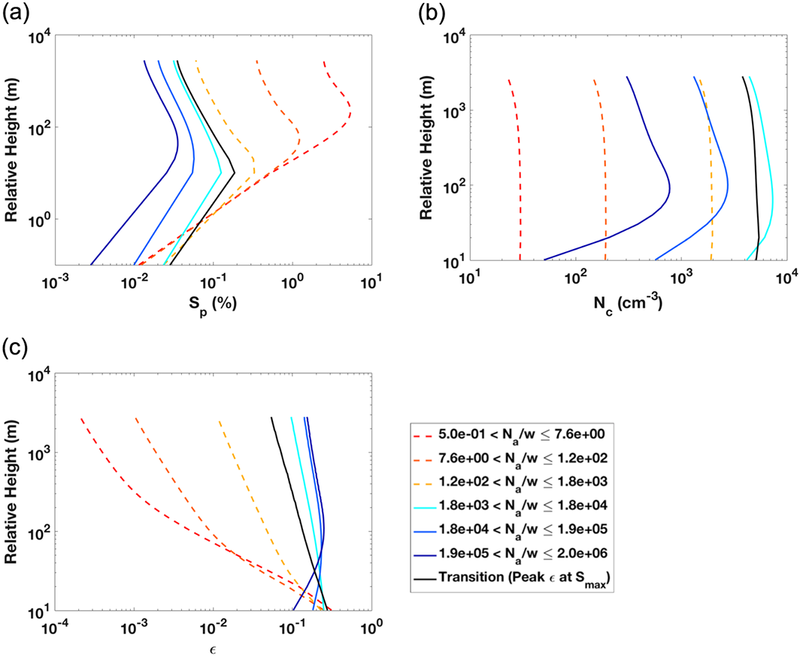 Vertical profiles of (a) parcel supersaturation (Sp), (b) cloud droplet number concentration (Nc), and (c) cloud droplet relative dispersion (ϵ) at different ratios of aerosol number concentration (Na) to vertical velocity (w). Aerosol-cloud interaction regimes change from aerosol-limited to transitional to updraft-limited regimes as Na/w increases. 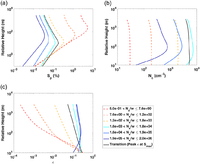 This study found that the relationships of cloud droplet concentration and spectral shape to aerosol number and updraft velocity have strong height dependence, which differs for various aerosol-cloud interaction regimes. The finding reconciles conflicting measurements, and has important implications for understanding and representation of aerosol-cloud interactions in large-scale models, especially for an updraft-limited regime where aerosol concentration is high relative to cloud updraft velocity. 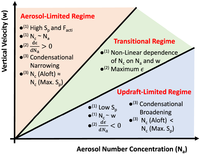 “condensational narrowing” in the aerosol-limited regime. (2) above the level of maximum supersaturation; some cloud droplets are deactivated into interstitial aerosols in the updraft-limited regime, whereas all droplets remain activated in the aerosol-limited regime. Further analysis shows that the particle equilibrium supersaturation plays an important role in understanding these unique features. Also examined is the height of warm rain initiation and its dependence on Na and w. The rain initiation height was found to depend primarily on either Na or w or both in different Na-w regimes, suggesting a strong regime dependence of the second aerosol indirect effect.